As you can imagine, a wide variety of rack power distribution unit (PDU) configurations are available based on parameters such as: number of phases, voltage, total amps, branch circuits, number of outlets, socket type, plug type, rack units consumed, and physical dimensions. 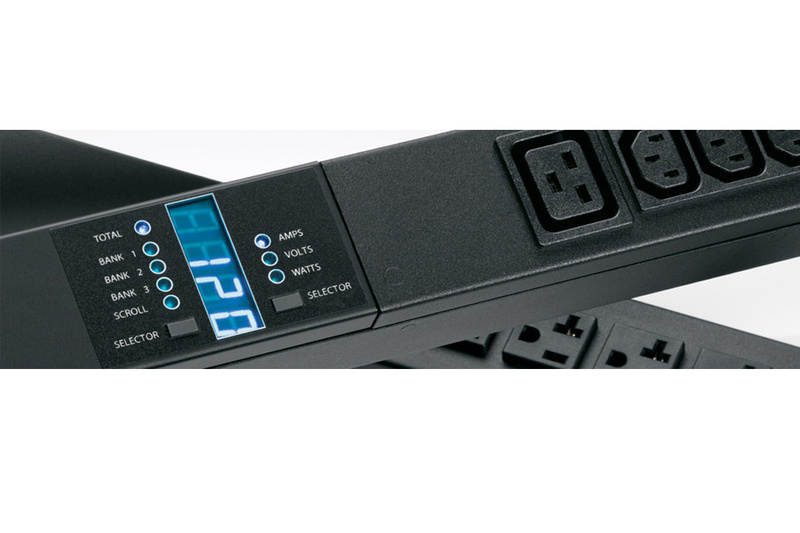 Beyond the functions of the basic rack PDU, additional capabilities are available in rack PDU categories we call metered, switched, and intelligent PDUs. Furthermore, if you cannot find an off-the-shelf rack PDU that matches your specific requirement, some vendors will assemble or even design a custom rack PDU (also called BTO/ETO: built-to-order/engineered-to-order). Here, we’ll discuss seven basic steps you should follow to help you to select and deploy the appropriate rack PDUs for your data center. For North America the input voltage is likely to be 120V single phase, 208V single phase, 208V three phase, or 400V three phase. Estimate the total power (kW, kVA) required. Determine the nameplate power rating of each device and calculate a budgeted power requirement, e.g. the sum of the nameplate values x 70%. Should additional power headroom be considered to accommodate future growth or accommodate different devices? Determine the PDU input voltage including the number of phases and amperage. This will determine the rack PDU plug type. For a data center where the power is already deployed to the rack, one of the best and easiest ways to determine the required PDU input is to know the receptacle into which the PDU will be plugged. This will determine the PDU outlet type(s) and the number of outlets required. Is remote power control required in order to reboot hung servers or keep outlets off to prevent unauthorized access, ensure proper provisioning, and avoid tripped breakers? Is PDU inlet-level metering sufficient, or is the additional detail of outlet-level metering desired? Determine the form factor that best fits the racks: typical horizontal PDU form factors are 1U (1.75 in., 44 mm) and 2U (3.5 in., 88 mm) high, there are also Zero U vertical PDUs of varying lengths. Find the power inlet location, i.e. where the power feed should enter the PDU. Consider how the input feed cable routes through the rack and cable bend radius. Typical cable feed options for rack PDUs are bottom/front, bottom/end, and top/end. Decide on the proper length of the PDU input power cord. Consider how the device plugs will be prevented from accidentally unplugging. There are retention clips, specially designed locking outlets or special power cords. Will environmental monitoring be used? Will the PDU be connected to the LAN via hardwire Ethernet connections, Wi-Fi, or Gigabit Ethernet? Do PDUs need to be cascaded/daisy chained together to minimize Ethernet drops? Are colors desired to indicate different power feeds, e.g. A and B feeds, or different power chains? Lastly, should you need help with any of these steps, leave your question below in the comment field or reach out to DCIMPro360. And do visit our PDU product selector to see all of the models that are readily available for you to purchase.